Due to weather conditions, Pride & Purpose Day activities scheduled for Saturday, Feb. 10, at Missouri Southern State University have been postponed. A new date for the event will be announced when it is rescheduled. Pride & Purpose Day will take place at 11 a.m. on Saturday, Feb. 10, in the North End Zone facility at Missouri Southern State University. 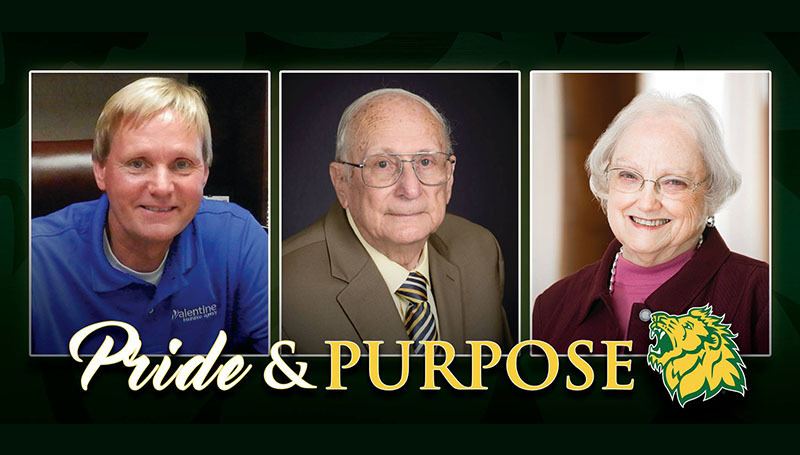 The day will honor three individuals who have made outstanding contributions to the success and growth of Missouri Southern over the years. The two Spirit of Service recipients will be John Cochran of Moberly, Mo., who graduated from MSSU in 1978, and Lorraine Whittington of Joplin, who graduated in 1982. The Lion-Hearted recipient will be Richard W. Massa of Joplin, former chair of the Communications Department and director of the Institute of International Studies at MSSU. Brunch reservations are available by calling 417-659-5466 or online through the MSSU Alumni web page under “events” at https://www.mssu.edu/advancement/alumni/ . The cost is $15 per person. Reservations are due by Friday, Feb. 2. John Cochran is a 1978 graduate of Missouri Southern, graduating with a degree in secondary education. A transfer student from Moberly Community College, John played Missouri Southern basketball for two years, as a guard. Born and raised in the Moberly area, he currently serves on the Moberly Area Community College Board of Directors, and was named the 2000 Moberly Area Community College Outstanding Alumni recipient. He also serves as Vice President of Rotary International Club. A volunteer for the Moberly Spartan Booster Club, John was the chairperson for their golf fundraiser for several years. He is also a MACC Board of Trustees founding board member for the Randolph County area YMCA and has served on the board for 10 years. John has also served as a board member for the Moberly Area Community College Foundation, and was Campaign Co-chair for the Moberly Area Community College Activity Center. In 1999, he served as the United Way General Campaign Chairperson. He has also served on the Moberly School District, as both a board member as the Board of Education President. He was awarded the Missouri Interscholastic Athletic Administrators’ Association, Distinguished Service Award in 2009. The award is presented to persons outside of the field of interscholastic administration in recognition of their service to interscholastic athletics. In 2013, John was awarded the Missouri Association of School Administrators Friend of Education Award. This is given annually to recognize non-educators for their contribution to education locally or statewide. John purchased the Valentine Agency from Jack Valentine in 1995. He is the agency owner and is licensed in all areas of insurance, focusing on individual, group life and health coverage. In addition to his volunteer service in the Moberly area, he has served Missouri Southern in a variety of areas including: Leadership Annual Giving donor for MSSU, underwriting for the Alumni Association bus trip to St. Louis Cardinal baseball game, donating to the men’s basketball trip to Puerto Rico, donating to the Puerto Rico Hurricane Relief fund, donating to the Coach Corn Court project, and has made many other donations over the years to MSSU. He is an alum that serves the community where he lives. He continues to be an avid supporter of MSSU. Lorraine Whittington has served the Joplin Community in a variety of capacities. While her children were still young, she became involved with volunteer service. Freeman Hospital was her first activity where she served in the snack bar. Throughout numerous years, she earned several 1,000-hour pins from Freeman Hospital. She joined the Epsilon Sigma Alpha (ESA) Women International and has spent 50 years serving in this organization, earning the position of State President. While serving as International Chaplain, Danny Thomas asked that they help raise funds for St. Jude Children Research Hospital. To date, ESA has raised $49 million dollars for St Jude. Lorraine was instrumental in starting this fundraiser, which continues to this day. She graduated from Missouri Southern in 1982 with a degree in Business Administration. After graduating, she joined the Business and Professional Women, Inc. organization in the mid-1980s, obtaining the status of State President. She strives to provide educational speakers to all those in her presence with information vital for good leadership and positive citizenship within the community. In 1992, she joined the American Association of University Women (AAUW) and she served as the President of the Joplin Branch for six years; longer than any other president since the branch was created in 1926. During her presidency, she assisted the group by hosting a Science, Technology, Engineering and Mathematics (STEM) seminar for local high school students. The program was such a success it has been repeated several times. She was also instrumental in starting a holiday auction to raise funds for a scholarship to MSSU. This activity has continued for the past eleven years with Lorraine acting as Chairman of the event for six years. A 2017 scholarship was awarded for a full year scholarship in the amount of $4,300 by AAUW. AAUW has raised money for this MSSU scholarship since the Dorothea B. Hoover AAUW Scholarship Foundation was developed in 1976. Lorraine is also a member of the Joplin Women’s Club, serving three years as President. She has been very instrumental in promoting the arts within the Joplin area. She currently volunteers as a docent at Spiva Center for the Arts and is a strong supporter of Pro Musica, Joplin Little Theater and the MSSU Lantern Society. Lorraine has supported Missouri Southern through donations to the Mission Hills Mansion restoration process and has been a loyal annual fund contributor over the years. She is a lifetime member of the MSSU Alumni Association. She has been active in the Presbyterian Church, serving as an elder for seven years, six years as a Congregational Life Chair, and is currently serving a three-year term as Stewardship Chair. She is also the treasurer for the Women’s Association at the Presbyterian Church. Richard Massa, a 1950 graduate of Joplin High School, secured degrees in journalism at the University of Missouri and began his teaching career at the university’s School of Journalism. He served in the military and taught in Mississippi and Oklahoma. In 1972, he joined the faculty of Missouri Southern State University as an associate professor of journalism and adviser to the student newspaper, The Chart. In 1979-80 he served as interim head of the Department of Language and Literature and then as acting head of the Department of English. In 1980 he became the first head of the newly established Department of Communications which he founded and in his 19-year tenure as department head established radio station KXMS-FM and television station KGCS. In 1996 he became the first director of the newly established Institute of International Studies, remaining also as head of the Department of Communications. In this dual position, he worked for the expansion of foreign language education and development of the first bilateral agreements between Missouri Southern and a number of universities in Europe and Africa and originated a number of programs still in existence. He received the Outstanding Teacher Award in 1982. In 1996, he received the Missouri Governor’s Award for Excellence in Education. He retired in 1999 and was awarded the title of professor emeritus. On his retirement, the Missouri House of Representatives and the Missouri Senate issued proclamations honoring him. He has been listed in a number of volumes, including Who’s Who in the World; Who’s Who in America; Who’s Who in Media and Communications; American Men of Science and Personalities of the South. In 2001 he received Missouri Southern’s Broadcast Pioneer Award for his achievements in telecommunications, and in 2012 he was named to The Chart Hall of Fame. In 2017, former students established an endowed scholarship in his name. During his years of retirement, he and his wife, who had retired from Pittsburg State University, have devoted much of their time working for charitable causes and have established scholarships at their alma maters, the University of Oklahoma and the University of Missouri, as well as at Pittsburg State University, while contributing to scholarship funds at the University of Science and Arts for Oklahoma. They also have contributed funds to Missouri Southern State University for various activities and programs, including the alumni center, the African Art collection, the music department, The Chart Hall of Fame, the Institute for International Studies, the Julio León Center for Health Sciences, and numerous memorial scholarships. They also have contributed to a number of area arts programs, most notably Pro Musica. For more information, contact the Missouri Southern Alumni Association at 417-659-LION (5466).